Thermal Printable Adhesive - Blank - Cardbadge With Expiring TIMEtoken (sold separately)- 1000/Pkg. Item#04102 - 2 1/8" x 3 13/16" Thermal Printable Adhesive "Blank" Cardbadge With Expiring Token (sold separately). Badges with TIMEtoken Indicators have a pre-printed bar area. Simply apply the TIMEtoken Indicator to the pre-printed bar area and the expiration process begins - Adhesive badges come rolled 200/roll - 1000/Pkg. 1" x 2" TIMEtoken Expiring FRONTpart - One-Day - BLANK - 1000/Pkg. Item#06147 - 1" x 2" TIMEtoken Indicator - BLANK - ONE-Day Expiration. TIMEtokens must be used with Bar BACKparts for it to expire. - 1000/Pkg. 1" x 2" TIMEtoken Expiring FRONTpart - One-Day - "VALID THIS DATE ONLY" - 1000/Pkg. Item#06118 - 1" x 2" TIMEtoken Indicator "VALID THIS DATE ONLY" One-Day Expiration. TIMEtokens must be used with Bar BACKparts for it to expire. - 1000/Pkg. 1" x 2" TIMEtoken Expiring FRONTpart - One-Day - "VISITOR" (Red)- 1000/Pkg. Item#06119 - 1" x 2" TIMEtoken Indicator "VISITOR" (Red) One-Day Expiration. TIMEtokens must be used with Bar BACKparts for it to expire. - 1000/Pkg. 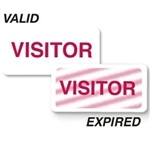 Manual Clip-On "Visitor" Cardbadge With Expiring TIMEtoken (sold separately)- 1000/Pkg. 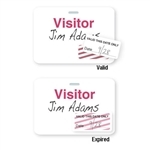 Item#05595 - 3" x 4" Manual (Hand-Writable) Clip-On "Visitor" Cardbadge With Expiring Token (sold separately). Badges with TIMEtoken Indicators have a pre-printed bar area. Simply apply the TIMEtoken Indicator to the pre-printed bar area and the expiration process begins - 1000/Pkg. 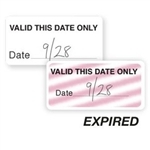 1" x 2" TIMEtoken Expiring FRONTpart - Half-Day - "VALID THIS DATE ONLY" - 1000/Pkg. Item#06418 - 1" x 2" TIMEtoken Indicator "VALID THIS DATE ONLY" Half-Day Expiration. TIMEtokens must be used with Bar BACKparts for it to expire. - 1000/Pkg. 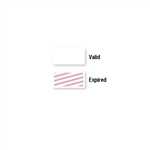 Thermal Printable Clip-On Cardbadge - Blank - With Expiring TIMEtoken (sold separately)- 1000/Pkg. Item#03983 - 3" x 4" Thermal Printable Clip-On Cardbadge With Expiring Token (sold separately). These badges work with any thermal printer and come fan-folded and blank so you can customize them to meet your needs. Badges with TIMEtoken Indicators have a pre-printed bar area. Simply apply the TIMEtoken Indicator to the pre-printed bar area and the expiration process begins - 1000/Pkg.